Lowly writer? Friend of Literature? Admirer of Bukowski? No matter what name you want to be called, many thanks to Bukowski on Wry for submitting this Christmas Pick. The Silver Birch Press Bukowski Anthology is a a 272-page collection of poetry and prose about Charles Bukowski as well as portraits of the author by over 75 writers and artists around the world. Contributors include people who knew Bukowski — friends, fellow poets, and people he met along the way — as well as those who feel as if they knew Buk. 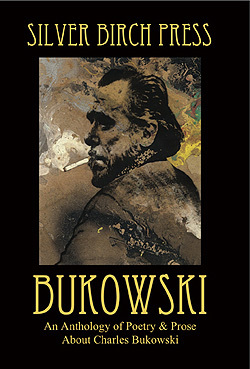 The collection includes poetry, essays, memoirs, short stories, vignettes, book excerpts, biographies, fantasies, satires, parodies, interviews, quips, and quotes about Charles Bukowski — as well as iconic photographs plus drawings and paintings of the man of many talents (poet, novelist, short story writer, artist) and names (Hank, Buk, Bukowski, Chinaski). Silver Birch creates lovely and powerful anthologies, and this is one of their best. This one includes guest editors: Jocelyne Desforges, S.A. Griffin, Suzanne Lummis, David Roskos, Joan Jobe Smith, and Eddie Woods. Also has contributions from Cadence contributors Donna Hilbert and RD Armstrong. What are you doing sitting there? Head over to Gatsby Books this second, before all these copies are gone!